There is lots of good karma in the air. I'm feeling it, people! If you're part of the YA writing community you probably follow Elana Johnson. She is all kinds of awesome, right? This week she has been celebrating her book being published. Elana Johnson's CONTROL ISSUES, set in a brainwashed society where those gifted with mind control best join the powers that be, but one rebel girl tries to beat them at their own game, to Anica Rissi at Simon Pulse, by Michelle Andelman at Lynn Franklin Associates (NA). 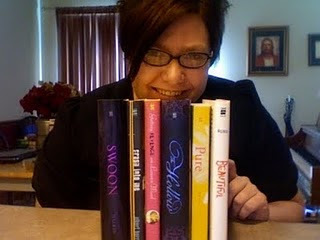 So, she's holding contests galore and today I am celebrating with her! By donating my TAGS-N-STONES JEWELRY as part of her Friday prize package! So head over there Friday afternoon for the contest, and show her some LOVE! Something else about Elena. She's been a generous writer/bloggy friend. She helped me with both of my query letters. She is the query QUEEN. She knows how to turn a regular old query into GOLD! So, fingers and toes CROSSED. Thanks Elana! And CONGRATS to you! HAPPY MEMORIAL DAY TO MY U.S. FRIENDS! Today's guest blogger is THE Elana Johnson! Oh, what a wonderful celebration for her! It is definitely a Memorial Day weekend...love her blog. Thanks for the introduction. Summer 2011 can't come soon enough for me! I love Elana's query and voice and blog and ebook on writing queries. Heck, I just plain love Elana. Cool jewelry! That was super nice of you to give a piece for her contest. Your jewelry is so cool. Hope I win! Elana does rock - as does your jewelry. And I am very excited about you querying!!! Congrats to Elena!! That's wonderful news! Enjoy the weekend...it looks like it's going to be beautiful in Cleveland! that's so awesome!! Elana is amazing and so are you for participating in the fun! have a fabulous weekend lovely! Congrats to Elena, I just recently ran into her through the network but read over her blog and she's so much fun to read. Yay, you're jewelry is in the prize packages :) Have a wonderful holiday weekend. I will be attending a Memorial Day service for the Vets here in town. Congrats to Elena! I don't know her, but I am heading over to check out her blog. So happy for her though. I love it when people accomplish something they want. It's just nice to know that it can still happen. As far as Memorial day goes, we are just hanging out with family. Hoorah for Elana!!!! And fingers crossed for shiny new queries. YAY! congrats Elana (love the name). I'm on my way over to tags and stones. Awesome! I'm entering, and I'd be thrilled to own a piece of your artistry! I love your jewlery and Elana. The contest is just too good to be true...I am clicking over there...now! Congrats for Elana! Have a great weekend! We are heading to a winery for a back porch concert. It's the band that played our wedding! Should be fun. Hi! I found you through Elana's blog--your jewelry is lovely! Congrats to Elana. I agree that she is awesome. Love your jewlery too. I already hopped across to check out the contest. Aw, thanks Christina. You are awesome! <3 ya! Your jewelry is interesting. Glad to meet you! So many new and fabulous blogs to see! I am on my way over there. This weekend we will be looking for something new and different--hopefully and bbq ribs for dinner. Yum. Soo excited for Elan! Glad to be a new follower. The jewelry is gorgeous. What a great giveaway. Elana is awesome and so are your - so nice of you to contribute to her celebration -- your jewelry is very cool. Just found you off of Guide to Literary Agents. Nice blog. I agree. Elana is the bomb.I'm so happy for her. Yay Elana!!! This is such fabulous news. And, I'm heading to her blog right now!! Elana is certainly the query queen! Very cool for you to join up for her contest! Thanks for joining in the fun with Elana. She's awesome. Yep, I definitely follow Elana, and I don't even write YA! First blog I ever followed, and I'm pretty sure I've found most of the blogs I'm following through her. She's fab!!! It's awesome you make your own jewelry. I have troubles when I try to be that creative. Give me something electronic, an iPod, Xbox, Playstation, cell phone, whatev, and I can fix it, but making things from scratch makes my mind go blank! Your jewelry looks really neat. And Elana's news is amazing!!! Jewelry looks beautiful! Congrats abound for Elana! She is so wonderful, and so well-loved! I'm so happy for Elana, and your jewelry is awesome. Dang! I'm so sad I missed out on the Friday giveaway, then. But as a consolation, I'm happy that I've now found your blog! It's great. Thanks! Happy Memorial day and woop woop for good karma. Good things DO happen for good people!! Wow, that must have been one of the most rewarding moments in her life. How great that you have a friend like that who can juice up your letter and get you pushed into the front of the line!